IHATED chia seed pudding the first time I tried it….but this one was delicious! This looks great. I’m starting to incorporate gelatin into my diet. Would that work with this? If so, how much should I add? I use Great Lakes. Thank you! So, I read all about chia seed and the different pudding recipes. Lots of health benefits, but also some caution should be taken; I, as one with low blood pressure (but I am not on medication), would probably not eat this on a daily basis, or at least moderate how much I would consume. I also read some about possible link to prostate cancer? I went with this recipe as it was a good one to start out with as a one serving recipe. I did use coconut almond milk. Definitely different. Wouldn’t eat it alone. I am having mine right now with raspberries and strawberries. My husband had some this morning and liked the “crunchiness” to it. As for the “serves 1”, we can definitely makes this a four serving. I am interested in trying it with cocoa, and adding some coconut to it!! Holy crap, thank you so much for posting this! It is gonna help me when I research Chia Seeds at the store! Awesome! 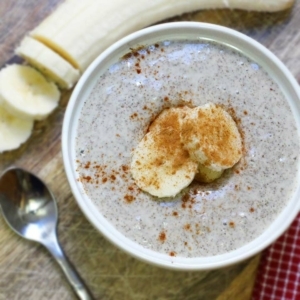 just to let you know I make this and blend a banana first then make it with almond milk and I absolutely love it…I will try the different ways that were suggested here…. This sounds awesome! Thank you for sharing! I love this recipe — have been using something similar to this for a while but using banana and no maple syrup. Now that the weather getting warmer, I like to put the mixture into a little container and freeze it for an hour, making a wonderful high-protein but sweet afternoon treat. Enjoy! If I heat this a little, ,not bring it to a boil of course, do you think it’lll destroy the omegas? Seed oils are very susceptible to light, air, and heat, which is why most people recommend storing raw seeds and their oils in the fridge. I would assume that heat would damage the omegas, so for the best benefit I’d enjoy this raw– either chilled or at room temperature. The friction from blending might actually warm it up gently, too! What is the consistency of this? I’ve never blended my chia puddings before – does it still “set” the same? Thanks! Yes, the chia seeds still “set” making for a thicker, gel-like pudding. It gets even thicker if you keep it in the fridge overnight! I just purchased my first bag of chia seeds today. I had a similar recipe chilling overnight in my fridge now, so hopefully it turns out well! I used two tablespoons of chia seeds, 3oz of chocolate almond milk, and 3oz of vanilla milk. Fingers crossed! I plan on adding some banana/other sweeteners come morning. The bag recommended this recipe so I played it safe. Can’t wait to further experiment with chia! I’m actually eating some right now! Made it last night before bed and it set perfectly. Topped it with sliced berries and bananas. YUM! Can you make this recipe using chia powder. Have a bag in my pantry and don’t know what to use it for? Any ideas? Love this recipe and found a modified one to this that may be more amazing!! Very similar but adding the banana first makes such a difference 🙂 Love all your recipes, hope you don’t mind me adding in this one! Mash the banana in a bowl. Add Chia seeds and cinnamon and then stir in the milk. Chill the bowl to let it set for at least 3 hours or overnight. Divide between 2 bowls and add your choice of toppings. Best recipe so far!!!! Delicious!!! This is deliciious. Because I eat high fat, low carb, I switched the milk out with heavy cream and added sugar free syrup instead of regular syrup. It was heavenly but because of the cream, it was very rich so you couldn’t eat much at one time. That is okay though because I use it as dessert. The second time I made it, I put in stevia instead of syrup and it was equally as good. Love it with cinnamon sprinkled on top. I think it would be good with berries in it also. This is such an awesome, easy breakfast. I have made this three times now and have experimented with a chocolate flavor. I also got my friends hooked on chia seeds because of this recipe. So good! Made it a few times and loved it. Never thought to blend first in vita mix. I will try that for sure. I am so glad I found your site!!! I just made this and it is delicious. I used half coconut milk and half water and I didn’t blend mine. I think my kids and hubby will love this. I made a double batch for them to try when they get home. I added frozen cherries and used almond extract instead of vanilla. Delicious! Thanks for sharing ! I made this today and it was delicious . I used almond vanilla and agave nectar . this recipe was awesome! I subbed agave for the maple and blended the ingredients with a frozen banana to thicken it up. I will definitely make this again. How bad is the maple syrup if you suspect you might have a candida-problem? I want to try this so bad! Hate doing my breakfast in the morning. 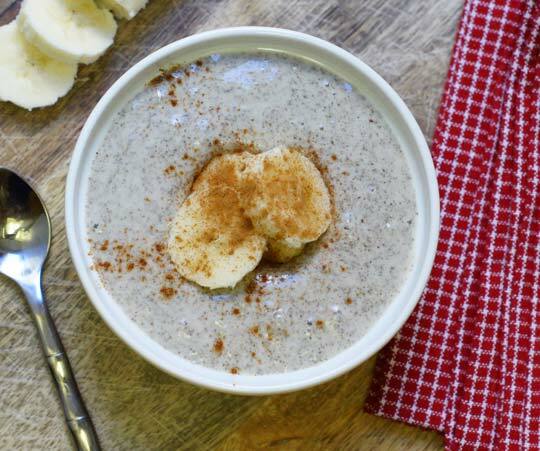 I just stirred up this chia pudding and can’t wait to try it tomorrow. It’s so easy. I love your recipes! For those of you trying to do low carb this is not for you. Looking up the carbs for the seeds and syrup it was 31 carbs. I was really disappointed as I was looking for a good breakfast and don’t like eggs. @Donna – I make a non wheat Malt-o-meal that’s great. I just cook up almond meal/flour with water on the stove the same as Malt-o-meal! I usually add some maple syrup and blueberries. I hope this helps. Thank you for posting this delicious recipe. It is a fun texture that also reminds me so much like the Cream of Wheat I loved as a kid. (Gluten-free now) So, this is a truly great find. I’ve just overcome some health issues and been using food network to learn to cook. I’ve been searching for a dairy free tomato soup for months and recently found your site. Thank you for your continued help. I have found that when i want something new, healthy, and fabulous I do not need to look much farther than your site. My 3 year old daughter has been a super challenge to feed healthily. She had lots of behavioral issues & knew it was diet related. I think with your many ideas she will truly grow up building a super strong immune system and avoid the problems that I incurred. She is happier than ever with all the changes in her diet. I do mostly paleo with her. Thank you for the many new ideas & all the resources. What an improvement on my every day. Thank you. I can’t wait to try this chia pudding. Looks amazing! I will be sharing your site with my health savvy friends! Just made this yesterday and had some this morning…it was delicious! I was pleasantly surprised by how great it tasted. Can’t wait to make more! Will this recipe work well with milled chia seeds as well please? I am NEW to all the Chia craze. Now that school is almost over and I am free over the summer, I wanted to see what chia has to offer tired, overweight, 48 year old woman. I hear and read that it will increase energy and decrease appetite. Many websites are intimidating because they mention ingredients I have never hear of before. Anyway, can regualr skim milk be used to make all the chia puddings and porridges? Nobody ever seems to mention regular skim milk. I am planning to bookmark this site, because it seems the most non-threatening that I have found. Yes, you are welcome to use any milk you like. I’m so glad to hear you’re enjoying my website! People do not mention skim milk, because there is a growing awareness of the health benefits of not drinking milk that is pastuerized and comes from cows living in torturous conditions. Cows are fed unnatural foods and antibiotics because of their horrifying living conditions, and so the milk is not so good for consumption in many cases. Even organic milk, is not best for some bodies, but other milks can be. Almond, flax, hemp, rice, quinoa milks, and other alternatives to cow milk you see mentioned are an invitation to try some other milks that may be better for your health and energy. Thanks for such a fabulous recipe. I have chia seed in the house all the time and never knew it could create such a delicious dish. I made it with unsweetened almond milk, blackberries and a dash of sliced almonds today. This will definitely become a regular in my diet. Trying your pumpkin granola recipe next! You have terrific ideas.